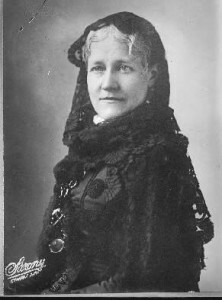 Harriet Spofford was a prolific nineteenth century writer and known to other authors of her time. According to The Online Archive of Nineteenth-Century Women’s Writings, Emily Dickinson was so “impressed with her writing that she asked to be sent everything she (Harriet) wrote” (Frechette). She was born in 1835 and, having been raised in a household of women because her father had left to seek his fortune the west, she went on to be known for her short fiction despite having written both poetry and novels. She began her writing career primarily to support her family after her parents became ill. Spending upwards of 15 hours every day in writing, her work soon appeared in local newspapers and periodicals. Even after getting married in 1865, she continued this trend. However, after some success, she began to write stories she knew would get published rather than receive literary praise (Frechette). Most of her stories centered on the romantic with her first novel being a gothic supernatural story. By the time of her death in 1921, she had written 32 books and hundreds of magazine and newspaper articles (Spofford). Even decades later, her legacy was one of complete devotion to the craft of writing. Frechette, Jacob and Jon C. Adams. “The Circumstances of Harriet Spofford’s ‘Circumstance.” The Online Archive of Nineteenth-Century Women’s Writings.Winter (2000). Print. 2002. Literature Resource Center. Web. 26 Nov. 2012. American Women Writers: A Critical Reference Guide for Colonial Times to the Present. Volume 4. New York: Ungar, 1979-1994. Blain, Virginia, Grundy, Isobel, and Clements, Patricia. The Feminist Companion to Literature in English: Women Writers From the Middle Ages to the Present. New Haven, CT: Yale University Press, 1990. Gold, Eva and Thomas H. Fick. “A ‘Masterpiece’ of the ‘Educated Eye’: Convention, Gaze, and Gender in Spofford’s ‘Her Story’. Studies in Short Fiction. 30.4 (Fall 1993): 511-23. Fern, Fanny. Ruth Hall. 1855. Rpt. NY: Rutgers UP, 1986. Fetterly, Judith. Provisions: A Reader From Nineteenth Century American Women. Bloomington: Indiana University press, 1985. 261-268. Homans, Margaret. Bearing the Word: Language and Female Experience in Nineteenth Century Women’s Writing. Chicago: University of Chicago Press, 1986. Spofford, Harriet Prescott. The Amber Gods and Other Stories. Ed. Alfred Bendixen, 1863. Rpt. New Brunswick: Rutgers UP, 1989.